Preheat oven to 475°F. Place the vegetables on a large rimmed baking sheet lined with parchment paper. Drizzle with olive oil and season with salt, pepper and thyme. Toss to coat. Roast in oven for 17 minutes, stirring once at the 12 minute mark. Remove from oven and set aside. Reduce heat to 350°F. Line another baking sheet with parchment paper. Prepare pie pastry according to directions. On a floured surface, roll dough out into a circle with 1/4 cm thickness. Place on prepared baking sheet. 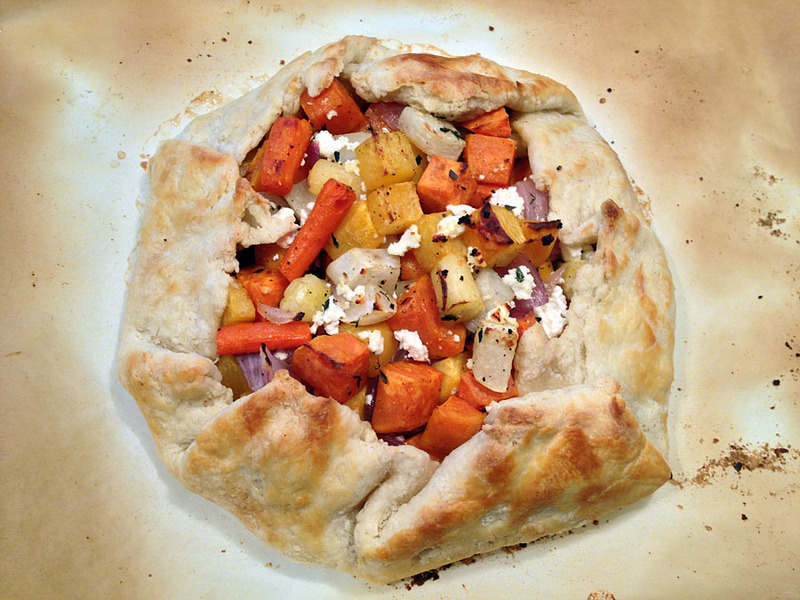 Mound roasted vegetables into the center of the dough, alternating with chèvre so that it is evenly dispersed. Drizzle with balsamic if using. Fold sides of pastry up over the vegetables. It doesn't have to be perfect! Bake in preheated oven for 25 to 30 minutes, or until crust is golden brown. You know that saying, "everything is better with bacon"? I say "everything is better baked in a pie crust!" This recipe is versatile, so use whatever vegetables strike your fancy!